“His assassination was the death of our future...Civil rights would have been at the forefront of his agenda," says activist Dolores Huerta. WASHINGTON — Fifty years ago this week, a mariachi band waited in the ballroom of a Los Angeles hotel for a presidential candidate who never showed up. 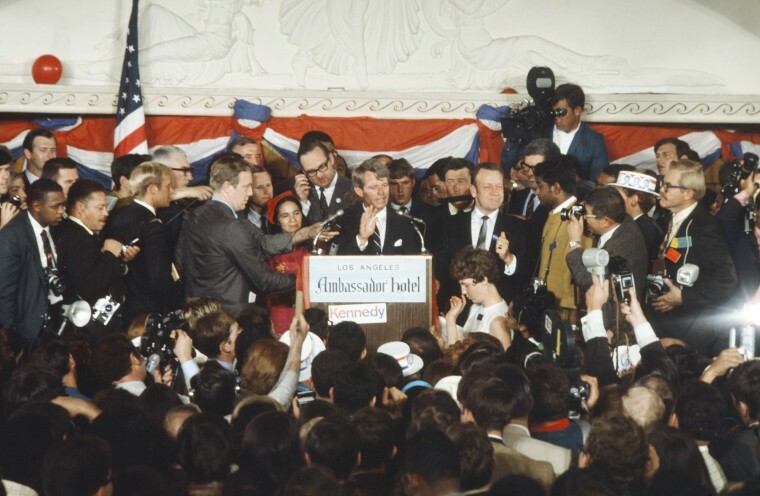 What was supposed to be a jubilant celebration capping a victorious win in the June 4, 1968 California presidential primary ended in tragedy when Senator Robert F. Kennedy was gunned down shortly after midnight on June 5, dying in the early hours of the following day. For United Farm Workers (UFW) co-founder Dolores Huerta, it was as if all the air had been forever sucked out of the room. “His assassination was the death of our future,” she told NBC News. That fateful day, Huerta had been on the podium with the Senator Kennedy when his primary victory was announced and was escorting him out to a nearby ballroom. Kennedy questioned how people could be arrested without committing a crime, and suggested — to cheers and applause — that the sheriff should “read the Constitution of the United States” during his lunch break. No one as prominent as Kennedy had come forward before to advocate for the predominantly Mexican American farm workers, who were protesting harsh labor conditions in California's grape fields and farms. Kennedy returned to Delano to visit UFW co-founder César Chávez during his 25-day fast for farm worker rights in 1968 and also held fundraisers for the UFW’s health clinic. It was Kennedy who called off the police when law enforcement officials tried to block hundreds of protesters who were marching from Delano to the state capital of Sacramento in support of farm worker rights. “It’s not really that well known but he was the one who told them, you can’t do this, you can’t block these people from marching,” Huerta said. These actions, she explained, helped Kennedy gain a UFW endorsement and the subsequent help from its army of farm workers who volunteered on his presidential campaign. Unprecedented turnout in largely Latino districts is credited with helping Kennedy achieve victory in the California primary and a commanding lead going into the Chicago Democratic convention. His assassination threw the Democratic Party into chaos; the convention itself that summer was marred by protests, violence and riots. “I was a Kennedy delegate and witnessed all that happened there,” Huerta said. Though it has been 50 years since his death, Huerta painfully remembers the details of that fateful day. “He was supposed to go with me to a press conference in the ballroom and he was walking with me when they came up to him and said ‘No, Senator, come this way, go through the kitchen,’ where they had set up for an (impromptu) press conference,” Huerta said. “I thought that was kind of strange to have a press conference set up in the kitchen, but that’s what happened. So instead of going with me to the ballroom where they had the mariachi band set up waiting for him, he went through the kitchen.” It was there where Kennedy was felled by three bullets. Huerta, who had been campaigning tirelessly for Kennedy throughout the state in the weeks leading up to the primary, said she felt an enormous sense of survivor’s guilt, that maybe more could have been done to make sure he had extra security. Huerta believes that if Kennedy would not have died, the American political landscape would be profoundly different. “Had Kennedy lived we wouldn’t have had Nixon, Watergate, Bush, or Trump. Kennedy was a different kind of individual. He believed in bringing people together. He was not divisive, he was a uniter," said Huerta. "He believed in inclusion and social justice and he didn’t wait for people to come to him, he would go to them and help. And he was very popular in Latin America," said Huerta. Aileen Roberta Schlef, currently the National Association of Hispanic Journalists DC Chapter Secretary, was a college student and Kennedy campaign staffer during his run for office. Reflecting on Kennedy's legacy, Huerta said the best way to keep Kennedy’s memory and work alive is to keep his values of helping others at the forefront. On Tuesday at the nation's capital, the Robert F. Kennedy 2018 Human Rights Award honored several organizations that serve as advocates for communities of color and for non-violence causes, including Color of Change, the International Indigenous Youth Council, March For Our Lives and United We Dream. To mark the 50th anniversary of his assassination on Wednesday, a memorial service is taking place at his final resting place at Arlington National Cemetery.